The six of us were part of a new offering from OARS, the famous river rafting company much better known for rafting the Grand Canyon than hiking in it. But the outfitter’s four day trip is an unforgettable way to experience the canyon, from top to bottom, in just a few days. And the experience is enhanced by the company’s decades of expertise gained from running trips through the canyon on the Colorado River. In fact our guide, Andre, is considered one of the most experience “boatmen” on the Colorado, having maneuvered his dory through the famous rapids here for decades. But on this trip, we’ll use our feet and not our oars, to descend through the incredible layer cake of the Grand Canyon. And we’ll get to learn something of its geology and history, as Andre–a geologist and anthropologist–is well used to teaching: when he’s not running the rapids on the Colorado, he is a university professor. It’s the best of both worlds: one of the planet’s greatest hikes, and the company of someone who knows a lot about it. Our small band met in Flagstaff the night before the trip to get acquainted, then the next morning piled in the van for the drive up to Grand Canyon National Park. But we took the long way around, and got to enjoy the thousand year old ruins at Wupatki, the volcanic cinder cone at Sunset Crater, and the ruins of Sinaguan (contemporary to the Anasazi) dwellings in Walnut Canyon, before entering the park proper via the east portal. 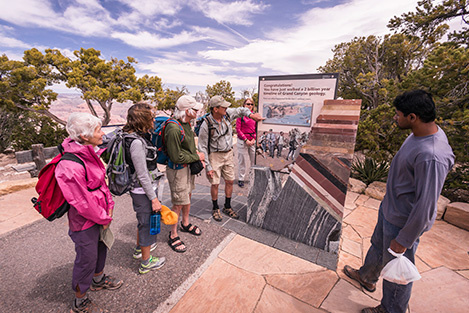 This route avoids much of the traffic coming up from Phoenix to the main park entrance, and provides a chance to see Mary Jane Coulter’s famous Desert View Tower on our way to accommodations on the South Rim. But it was when we rousted ourselves early and actually began the trek at dawn the following morning that we could settle into our adventure. This is what it’s all about: hiking down into one of the most beautiful natural features on earth under our own steam, taking in the mind-blowing vista of the canyon at sunrise. Humbling is the word that comes to mind as we stop to gaze across to the canyon’s wild North Rim and look down to O’Neill Butte, day-glo orange in its sunrise colors. We were focused completely on the beauty, as we all hiked down burdened with just light day packs. OARS arranges for the mules to carry down any overnight gear we wanted to have with us. 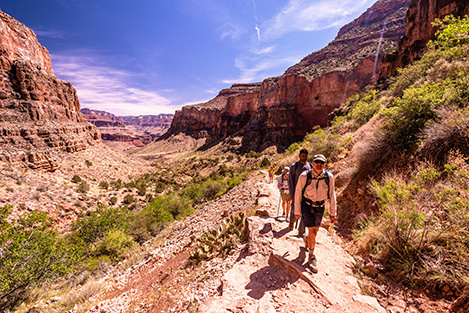 We each moved at our own pace as we descended through the landmarks on the South Kaibab, sometimes spread out along the trail, sometimes together. Ooh Ahh Point is the first, and possibly the best place in the canyon to watch the sun come up, as the view to the east is unobstructed. We dropped quickly down the steep trail through the Coconino Sandstone to Cedar Ridge, a favorite stop for the mule trains and trekkers alike. Below that we hiked around the east side of O’Neill Butte to Skeleton Point, a good place to rest and have an early lunch. Our group was diverse, with a pair of friends from California, two sisters from Oregon, a photo buff from Texas, and one mid-westerner, from Indiana. There’s no better way to get to know a small group of people than take a hike through a beautiful place, and our small band was quickly becoming a cohesive and friendly clan. It’s not until you hike below the Redwall Limestone down to the intersection with the Tonto Trail, and just beyond that, to the Tipoff, where the majesty of the canyon architecture really shows itself. 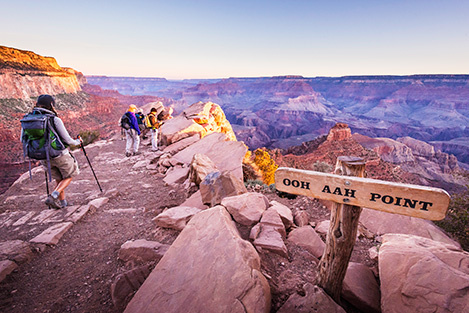 Here, at mid-height in the canyon, you begin the steepest descent on the South Kaibab–a surprising 22 per cent grade–and finally get a glimpse beyond the Tapeats Sandstone and down to the Colorado River and the bridges that cross it. Our group crossed the “Black Bridge,” the one favored by the mule teams because it has a solid deck, and walked out on to the River Trail on the north side of the Colorado. The rest of the afternoon was ours to do with as we pleased. 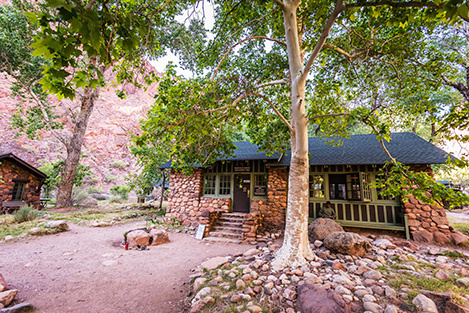 I found a good lounging rock in Bright Angel Creek and caught up on my notes before heading back down to the Colorado River and sandy “boat beach.” Phantom Ranch is unpretentious and easy. You can get a private cabin, but most people do what our group did and stay in the bunkhouses, several of each for men and for women. Showers and clean sheets were a luxury for most of us accustomed to camping. Situated by the creek, and only minutes from the river, an afternoon at Phantom is a treasure. The staff kicks everyone out of the canteen about 4 so they can prepare for dinner. The evening meal is served in two sittings, with steak or beef stew being the famous (and only) choices, but there’s salads of many sorts for those who wish otherwise. Our group sat together during the family style meals, which are highly social affairs where people from around the world introduce themselves. Lots of people hang around afterwards to talk and get to know other parties, though many hikers choose to do some star gazing in the clear air and then go to bed early–and for good reason. For as quick as the hike down the South Kaibab was, tomorrow would be a different story: the hike back to the rim via the Bright Angel Trail, longer (at better than 9 miles) but less steep, so better suited to the ascent. At dinner Andre forewarned us of our alpine start: be packed and ready to go by five, when we were to meet for breakfast back at the canteen. We packed up almost everything we had with us for the mules to carry up, to lighten our load, keeping only water bottles and hydration systems in our own packs. Breakfast at Phantom Ranch is generous in quantity, a good thing considering the epic uphill hike to come, and it’s wise to take advantage. We all ate heartily, and then grabbed a sack lunch before heading out front to meet Andre. With the entire party together, we hiked back to the Colorado, crossed the Silver Bridge (it has a grate decking, so the mules don’t use it) and started up the River Trail alongside the Colorado. But the route soon turns uphill on the Bright Angel Trail to begin what for many is among the toughest trail days they will have. Our group was fairly well matched in speed and fitness, so we stayed together as we ascended through the famous landmarks. Andre took some time to explain what we were seeing, but climbing out of the Grand Canyon is largely a personal affair, a private struggle with fitness and will power: one foot in front of the other, over and over again, to gain the almost 5,000 vertical feet back to the South Rim. Up the Pipe Creek drainage we went, eventually reaching the famous switchbacks of the Devil’s Corkscrew, thankfully still in the shade, before arriving at the midway point in terms of distance at Indian Garden. We made our way up the final thousand feet and met at the ice cream stand, perhaps the most popular spot on the South Rim. With smiles and high fives all around, our merry band had accomplished our objective. Everyone made it, and our success strengthened our bonds. After a welcome shower in our accommodations, we made our way to the tony El Tovar Hotel where OARS had arranged a celebratory dinner in the iconic dining room for us. It was an exquisite way to put a finishing touch on our Grand Canyon hiking adventure, to get a feel for the ambience in the historic hotel, and to enjoy the partnerships that we had formed in the past few days. Our final day was spent hiking the rim trail for five miles as Andre gave us a geology lesson, and watching a performance by Navajo dancers at the famous Hopi House. Then it was time to pile into the big van for the drive back to Flagstaff. What struck me on the ride back was how easy OARS had made the entire adventure. 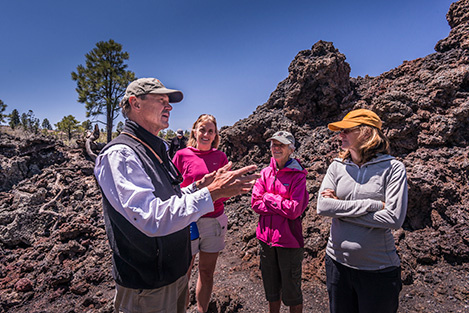 No hassle trying to find hiking permits, no hard-to-get reservations to make at Phantom Ranch or on the South Rim–nothing to do, in fact but show up in Flagstaff on time. It got me thinking: I might want to do this again, and soon. OARS is arguably America’s premier river outfitter, offering an extensive menu of trips, from it’s storied Grand Canyon river trips to those on other famous rivers such as the Tuolumne, the Yampa, the Salmon, the Green, as well as rivers in Alaska andCanada. Whether it’s rafting, hiking, kayaking, or specialty trips like its wine trips, theOARS catalog has something for everyone. 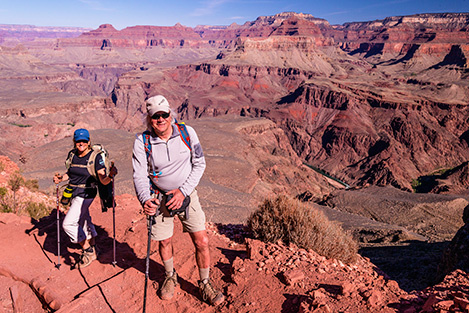 Click here for more on OARS new product, the Grand Canyon hiking trips, of which more are schedule for early fall.